Going green is a great idea for three different reasons. First of all, green living practices can actually save you money. In today’s economy, that is definitely a huge benefit. Second, going green can be great for the planet. 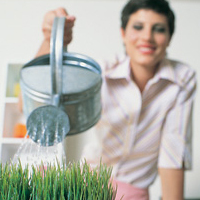 Third, green living practices can actually improve your personal health. In fact, here are 8 great go green tips for better health. Planting your own garden will do a lot of lovely things for you and for your home. For instance, the plants will improve the air quality in your yard. That’s great for you, your kids and your pets, as well as the wildlife in your area. Beyond that, growing your own vegetable garden will allow you to know exactly what has gone into each dish that you cook. You won’t have to worry about pesticides, price gouging and other problems. You will know the grower because the grower will be you. You can’t always grow everything on your own. So, if you need to buy food in the stores, be sure that it is organic food. Organic food costs a bit more, but it is much healthier for you. Also, just think of all of the chemicals that you are keeping out of the environment by refusing to buy overly-processed foods. Unfortunately, many people smoke. It really is a filthy and unhealthy habit. Also, when you multiply the pollution that one cigarette creates times the number of cigarettes you smoke in a day times the number of smokers on the planet, well, the results are alarming. If you aren’t a smoker, don’t put up with other people smoking in your home, car or office either. Toaster ovens are extremely easy to use. They heat up quickly and use almost no energy. They’re also very easy to clean, which makes them wonderful for the environment, as opposed to large ovens, which are energy guzzlers. As for your health, you’d be amazed how healthy using a toaster oven can be. For one thing, broiling is known as one of the healthiest cooking methods around and most modern toaster ovens have broil functions. It certainly beats pan frying your food. Of course, most toaster ovens can also bake, toast or just warm food up, also, which makes them a great addition to any home kitchen. Also, many studies have indicated that microwave ovens can be hazardous to your health. Since toaster ovens can handle almost anything that you may want to microwave, you might want to consider using your toaster oven more often like a Black and Decker Toaster Oven. Chances are that you care about the sate of your skin. If so, there’s no need to sacrifice your skin care routine in exchange for saving money or saving the environment. All you have to do is find yourself some green skin care products. Many of them are both effective and inexpensive. Another thing that you really can’t avoid is cleaning your home. However, you shouldn’t do it with commercial cleaning products. Breathing that stuff in is not good for your family or your pets. The environment also suffers from the use of chemical-filled cleaners. So, the next time you want to clean, reach for baking soda, vinegar or lemon juice, not some cleaner that you bought at the store. In your home, office or car, make use of natural sunlight and air flow. Simply opening a window can cool or light the area that you are in. That will help you to get fresh air and save on your electric bills. Finally, use your feet more. In other words, walk or ride a bicycle whenever you can. Cars may be faster and more convenient, but they are also expensive and they pollute the environment. So, when you’re not in a rush, use your feet and take some time to enjoy the day.